The Answer of John Damer Esquire, One of the Respondents to the Appeal of Francis Garvan Gentleman, was brought in. E. of Inchiquin's Petition referred to Judges. It is Ordered, That the Consideration of the said Petition be, and is hereby, referred to Mr. Justice Probyn and Mr. Justice Denton; with the usual Directions, according to the Standing Order. The House being moved, "That John Percival Gentleman may be permitted to enter into a Recognizance for Robert Dillon and others, on account of their Appeal depending in this House; they residing in Ireland:"
It is Ordered, That the said John Percival may enter into a Recognizance for the Appellants, as desired. The like Motion and Order, for Richard Aspinwall Esquire to enter into a Recognizance for Thomas Butler Esquire and others; for the same Reason. The like Motion and Order, for Ralph Knox, of London, Merchant, to enter into a Recognizance for Dame Letitia Gore Widow, and others; for the same Reason. The like Motion and Order, for Alexander Baillie Gentleman to enter into a Recognizance for Viscount Garnock; for a Reason of the same Nature. The like Motion and Order, for Robert Garden Gentleman to enter into a Recognizance for Miss Mary Buchan; for the same Reason. Sir Ja. Mackenzie's Petition referred to Judges. It is Ordered, That the Consideration of the said Petition be, and is hereby, referred to the Lord Chief Baron of the Court of Exchequer and Mr. Justice Denton; with the usual Directions, according to the Standing Order. The Order being read, for the Attendance of Mr. Whitehead and R. Dodsley, the supposed Author and Publisher of a printed Pamphlet, intituled, "Manners, a Satire:"
The said Dodsley was called in: And the said Pamphlet being shewed to him, he owned, "He was the Publisher thereof;" and acquainted the House, "That he had the Copy of Mr. Paul Whitehead, who was to have the Money the Books were sold for, paying for Paper and Print; and, as it was a Satire, thinking it might give Offence, did not care to print it without Mr. Whitehead's Name to it, which was in the Title when he gave it him to print." Then the said Mr. Whitehead was called for. Mr. Foot, One of the Door-keepers, was called in; and, being sworn, was examined as to the Service of the Order for the said Whitehead's Attendance: And acquainted the House, "That, on Friday Evening last, he went to Mr. Whitehead's House, to serve him with the said Order; who not being then at Home, he went again the next Morning; and being told by his Servant, he was not stirring, he left the Order, and went again some Time after; when the Servant told him, her Master had seen the Order, and said, he would attend the House accordingly." He is directed to withdraw. Ordered, That the said Whitehead be taken into Custody, by the Gentleman Usher of the Black Rod, for his Contempt, in not attending this House, according to the said Order. Resolved, "That the same is a wicked, malicious, and infamous Libel, containing divers scandalous Matters, and highly reflecting on several Lords of this House." Then it was likewise moved, "To order, that the said Dodsley, having confessed himself the Publisher of the said Pamphlet, be, for his Offence, taken into Custody by the Gentleman Usher of the Black Rod, and there safely kept till the further Order of this House." The previous Question was proposed, and put, "Whether that Question shall be now put?" Ordered also, That the said Gentleman Usher do forthwith seize the several printed Copies of the said Pamphlet, which may be in the Possession of the said Dodsley, and deliver the same into the Custody of the Clerk of this House. Dominus Cancellarius declaravit præsens Parliamentum continuandum esse usque ad et in diem Mercurii, decimum quartum diem instantis Februarii, hora undecima Auroræ, Dominis sic decernentibus. Hodie 1a vice lecta est Billa, intituled, "An Act for Sale of Part of the Estate of Richard Berney Esquire, deceased, for discharging Encumbrances thereupon." Annesley's Petition referred to Committee of Privileges. 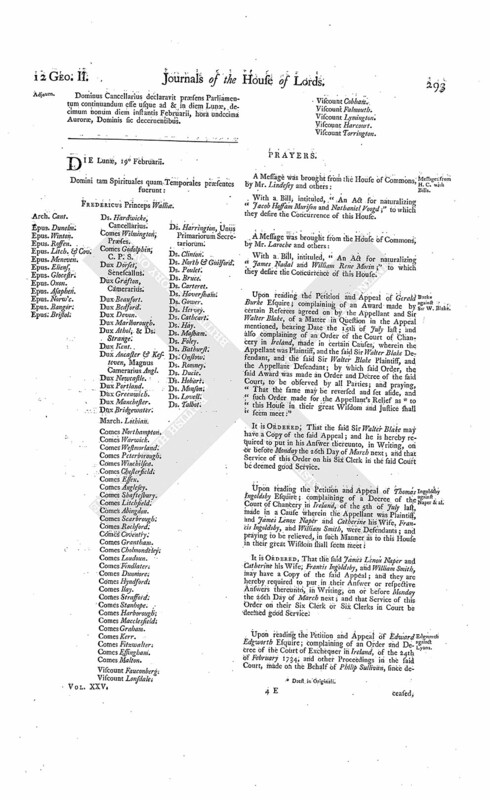 Upon reading the Petition of Francis Annesley Esquire; praying, "In regard the Tenants of the Estates devised to him by Arthur late Earl of Anglesey, which lie dispersed in many Counties in England and Ireland, are, during the Disputes between the Petitioner and the present Earl of Anglesey, kept under great Uneasiness, and in Suspence to whom to pay their Rents, many of which Rents may be lost by Insolvency; that the said Earl may be permitted to waive his Privilege, in all Actions and Suits which the Petitioner hath commenced, or may commence, against him, his Agents or Servants, or any other Person who pretends Title under him, for or concerning any Real Estate devised to the Petitioner by the said late Earl of Anglesey, and which the present Earl, by his Bill in the Court of Chancery in Great Britain, prays to be quieted in the Possession of; and, if he shall not be voluntarily inclined so to do, that the Petitioner may have Directions to proceed therein, in examining his Witnesses, to prove the Will of the said late Earl of Anglesey, and otherwise, so as not to incur the Displeasure of this Honourable House:"
It is Ordered, That the said Petition be referred to the Lords Committees for Privileges; their Lordships to meet on Monday Morning next. Kinloch against Rochead & al. Upon reading the Petition and Appeal of Mr. Francis Kinloch Advocate, One of the Heirs of the last Settlement of Sir James Rochead of Innerleith Baronet, deceased; complaining of certain Interlocutory Sentences, or Decrees, of the Lords of Session in Scotland, of the 23d of June and 6th of July 1738; and of an Interlocutor of the Lord Ordinary, of the 11th of the same July; and an Interloeutory of the whole Lords, the 29th of the same Month, made on the Behalf of Dame Mary Rochead and Sir Francis Kinloch her Husband, David Kinloch and Alexander Kinloch, Sons of the said Sir Francis Kinloch by the said Dame Mary his Wife, Sir James Dalrymple Baronet, James, Hugh, Charles, and John Dalrymple, Sons of the said Sir James Dalrymple, James Cathcart of Carbiston, Mrs. Elizabeth Rochead Spinster, Alexander Hamilton of Pencaitland Writer to the Signet, Mr. Hugh Murray Kynnynmound of Melgum, Thomas Dundas of Lethem, John Rochead Merchant in Edinburgh, Mr. Hugh Sommervill of Innerteil Writer to the Signet, and the Tutors and Curators of such of them as are Infants; and praying, "That the same may be reversed or varied; and that the Appellants may have such Relief as to this House shall seem meet:"
It is Ordered, That the said several Parties last mentioned may have a Copy of the said Appeal; and they are hereby required to put in their Answer or respective Answers thereunto, in Writing, on or before Wednesday the 14th Day of March next; and that Service of this Order on their Agents or Procurators be deemed good Service. The House being moved, "That Sir Robert Monro Baronet may be permitted to enter into a Recognizance for Mr. David Monro, on account of his Appeal depending in this House; he being in Scotland:"
It is Ordered, That the said Sir Robert Monro may enter into a Recognizance for the Appellant, as desired. The like Motion and Order, for Alexander Baillie Gentleman, to enter into a Recognizance for Robert Geddes of Scotstoun Esquire; for the same Reason. The like Motion and Order, for Alexander Ross Gentleman, to enter into a Recognizance for Mr. Archibald Murray Advocate; for the same Reason. Marq. Annandale against E. and C. Hoptoun, et è contra. It is Ordered, That the further Hearing of the said Cause be adjourned till To-morrow; and the Counsel to be called in exactly at Twelve a Clock. Dominus Cancellarius declaravit præsens Parliamentum continuandum esse usque ad et in diem Jovis, decimum quintum diem instantis Februarii, hora undecima Auroræ, Dominis sic decernentibus. Hodie 2a vice lecta est Billa, intituled, "An Act for Sale of Part of the Estate of Richard Berney Esquire, deceased, for discharging Encumbrances thereupon." Their Lordships, or any Five of them; to meet on Friday the 2d Day of March next, at the usual Time and Place; and to adjourn as they please. It is Ordered and Adjudged, by the Lords Spiritual and Temporal in Parliament assembled, That such Parts of the Interlocutors of the 24th of June 1736, and 31st of January 17377/8, whereby it is found, "That, in as far as the Respondents the Earl and Countess of Hoptoun founded their Claim upon the Act of Parliament in the Year 1695, for obviating the Frauds of Apparent Heirs, and the Appellant the Marquis was found liable on the said Act, Relief was competent to him the said Marquis against the Executry, or any other separate Estate of Marquis James," be, and are hereby, reversed: And it is hereby Declared, That, from the Nature of the Pursuers Demand, and the Frame of the Articles of January 1726/7, no such Relief is competent in this Case to the said Appellant the Marquis: And it is further Ordered and Adjudged, That so much of the Interlocutor of the 8th of February 17377/8, whereby it is found, "That the said Appellant the Marquis is liable, to the Respondents the Earl and Countess of Hoptoun, for the Sum of One Thousand Two Hundred and Twenty-five Pounds Sterling, over and above the Five Years taxed Rent, in Terms of the Libel, and Articles of Agreement libeled on," be, and the same is hereby, reversed: And it is hereby further Declared, That the said Appellant the Marquis is not liable for the said Sum of One Thousand Two Hundred and Twenty-five Pounds, or, at the Option of the said Countess, to such Sum as should be equivalent to Half of the Rents of Craigishall, to be uplifted and received by Marquis James, at the Rate of Four Hundred and Fifty Pounds, mentioned in the said Articles, the same appearing to be gratuitous as to those particular Sums: And it is further Ordered and Adjudged, That the other Interlocutors complained of be varied and rectified, agreeably to this Determination; but that the said Interlocutors, in all other respects, be, and are hereby, affirmed. Committee of Privileges, on Mr. Annesley's Petition, adjourned. The House being moved, "In regard it may be necessary to have some Witnesses sworn, to give Evidence to the Committee of Privileges, to whom the Petition of Francis Annesley Esquire, in relation to the Earl of Anglesey's Privilege, stands referred; that the Sitting of the same be adjourned till Wednesday next:"
It is Ordered, That the Sitting of the said Committee be adjourned to Wednesday next accordingly. Dominus Cancellarius declaravit præsens Parliamentum continuandum esse usque ad & in diem Lunæ, decimum nonum diem instantis Februarii, hora undecima Auroræ, Dominis sic decernentibus. With a Bill, intituled, "An Act for naturalizing Jacob Hoffam Murison and Nathaniel Voogd;" to which they desire the Concurrence of this House. With a Bill, intituled, "An Act for naturalizing James Nadal and William Rene Morin;" to which they desire the Concurrence of this House. Burke against Sir W. Blake. 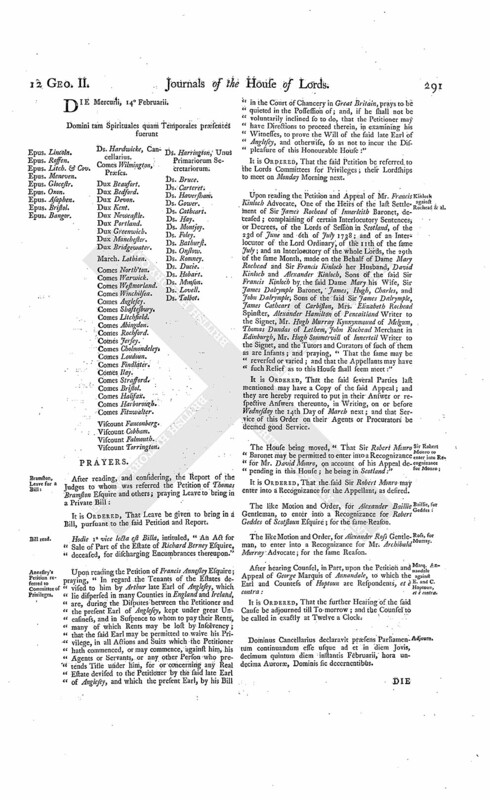 Upon reading the Petition and Appeal of Gerald Burke Esquire; complaining of an Award made by certain Referees agreed on by the Appellant and Sir Walter Blake, of a Matter in Question in the Appeal mentioned, bearing Date the 15th of July last; and also complaining of an Order of the Court of Chancery in Ireland, made in certain Causes, wherein the Appellant was Plaintiff, and the said Sir Walter Blake Defendant, and the said Sir Walter Blake Plaintiff, and the Appellant Defendant; by which said Order, the said Award was made an Order and Decree of the said Court, to be observed by all Parties; and praying, "That the same may be reversed and set aside, and such Order made for the Appellant's Relief as (fn. 1) to this House in their great Wisdom and Justice shall seem meet:"
It is Ordered, That the said Sir Walter Blake may have a Copy of the said Appeal; and he is hereby required to put in his Answer thereunto, in Writing, on or before Monday the 26th Day of March next; and that Service of this Order on his Six Clerk in the said Court be deemed good Service. Ingoldsby against Naper & al. It is Ordered, That the said James Lenox Naper and Catherine his Wife, Francis Ingoldsby, and William Smith, may have a Copy of the said Appeal; and they are hereby required to put in their Answer or respective Answers thereunto, in Writing, on or before Monday the 26th Day of March next; and that Service of this Order on their Six Clerk or Six Clerks in Court be deemed good Service. Upon reading the Petition and Appeal of Edward Edgworth Esquire; complaining of an Order and Decree of the Court of Exchequer in Ireland, of the 24th of February 1734, and other Proceedings in the said Court, made on the Behalf of Philip Sullivan, since de ceased, to whom Charles Lyons Merchant is Administrator; and praying, "That the same may be reversed; and that certain Premises in the Appeal mentioned may be restored to the Appellant, and Amends made him for the Mesne Profits since the First of May 1735, when he and his Tenant were obliged to quit Possession thereof; and that such Order may be made for the Appellant's Relief as to this House shall seem meet:"
It is Ordered, That the said Charles Lyons may have a Copy of the said Appeal; and he is hereby required to put in his Answer thereunto, in Writing, on or before Monday the 26th Day of March next; and that Service of this Order on his Attorney in the said Court be deemed good Service. Sir W. Billars & al. against D. Norfolk & al. 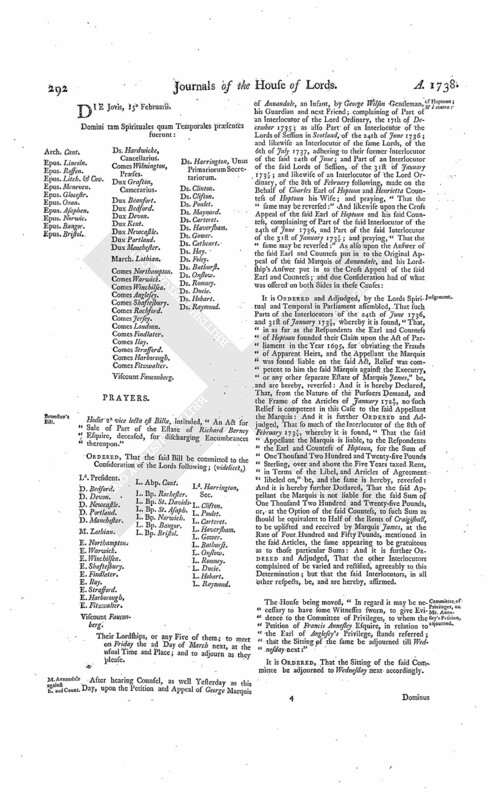 Upon reading the Petition and Appeal of Sir William Billars Knight, John Lawton and Nicholas Paxton, Esquires, Trustees for certain Creditors of the Governor and Company of Undertakers for raising the Thames Water in York Buildings; complaining of several Interlocutors, as well of the Lord Ordinary, as of the Lords of Session in Scotland, of the 26th of July 1737, and 7th of February following, the 17th of November 1738, and 12th of January 1738/9, made on the Behalf of Edward Duke of Norfolk, Sir Robert Sutton, Sir Robert Clifton, Lieutenant General Wade, and others, Parties to the Suit in the Appeal mentioned; and praying, "That the said Interlocutor of the 26th of July, as to the Points therein determined, and also the other Interlocutors of the said 17th of November and 12th of January, may be reversed, varied, or amended; and that such Part of the Interlocutor of the 7th of February 1737/8, as repels the Reason of Reduction, may be affirmed; and that the Appellants may have such other Relief as to the House in their great Wisdom and Justice shall seem meet:"
It is Ordered, That the said Edward Duke of Norfolk, and the other Parties last named, may have a Copy of the said Appeal; and do put in their Answer or respective Answers thereunto, in Writing, on or before Monday the 19th Day of March next; and that Service of this Order on their Agent or Agents, Procurator or Procurators, severally, in the Court below, be deemed good Service. Sir G. Caswall & al. against Houghton. Upon reading the Petition and Appeal of Sir George Caswall Knight, Jacob Sawbridge Esquire, Robinson Knight, and Sir Henry Blunt Baronet; complaining of certain Orders and Decrees of the Court of Exchequer, of the 16th of May 1737, and 5th of June last, and also of an Order of the said Court, of the 6th of December following, made in certain Causes, wherein Thomas Houghton was Plaintiff, and the Appellants Defendants; & e contra; and praying, "That the said Orders and Decrees, so far as the same relate to the Matters in the Appeal mentioned, may be reversed; and that the Appellants may have such Relief as to the House shall seem meet:"
It is Ordered, That the said Thomas Houghton may have a Copy of the said Appeal; and he is hereby required to put in his Answer thereunto, in Writing, on or before Monday the 6th Day of March next. 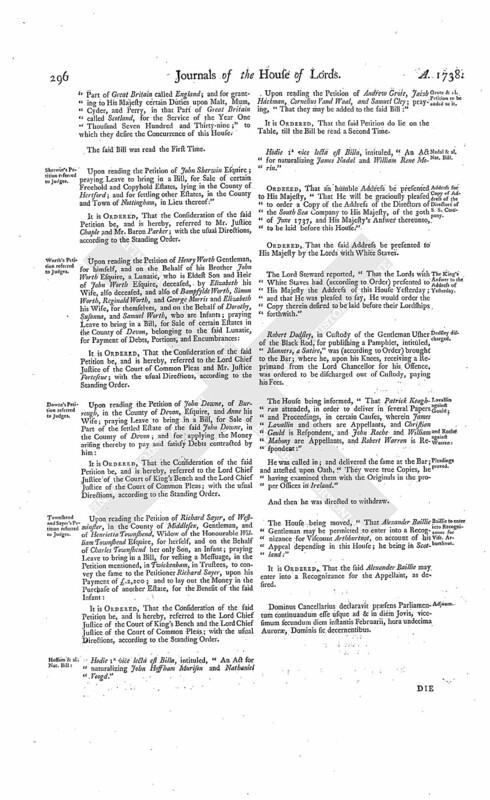 Upon reading the Petition and Appeal of John Viscount of Arthburtnot, and the other Creditors of William Morison of Preston Grainge Esquire; complaining as well of certain Interlocutors of the Lord Ordinary, as of the Lords of Session in Scotland, of the 12th of January 173¾, the 22d of November 1734, and 9th of January 1734/5, and 28th of November 1735, made on the Behalf of John Spotswood; and praying, "That the said Interlocutors may be reversed; and that the Appellants may have such Relief as to the House in their great Wisdom shall seem meet:"
It is Ordered, That the said John Spotswood may have a Copy of the said Appeal; and he is hereby required to put in his Answer thereunto, in Writing, on or before Monday the 19th Day of March next; and that Service of this Order on his Procurators, Agents, or Solicitors, in the Cause in the Appeal mentioned, be deemed good Service. Upon reading the Petition and Appeal of Valentine Quin Esquire; complaining of an Order of the Court of Exchequer in Ireland, of the 10th of December 1736, and an Order of the same Court of the 11th of February following; and praying, "That the same, and all subsequent Proceedings thereupon, may be reversed and set aside; and such Order and Decree made for the Appellants Relief, as to the great Wisdom and Justice of this House shall seem meet; and that Samuel Langley, Thomas Cotton and Elizabeth his Wife, and John Johnson Administrator of Debora Cox, may be ordered to answer the said Appeal:"
It is Ordered, That the said Persons last named may have a Copy of the said Appeal; and they are hereby required to put in their Answer or respective Answers thereunto, in Writing, on or before Monday the 26th Day of March next; and that Service of this Order on their respective Attorney or Attornies in the said Court, be deemed good Service. Proceedings, &c. of Commissioners of Westminster Bridge delivered. "Proceedings of the said Commissioners, from March 1st, 1737/8, to February 7th, 1738/9, inclusive." Also, "Contracts, &c. by the same Commissioners, or their Nominees, from 9th June, 1738, to 15th February following." And likewise, "Accompts of Treasurer to the said Commissioners, from June 10th, 1738, to 14th November following." Dodsley, Publisher of "Manners, a Satire," to be brought to the Bar. Upon reading the Petition of Robert Dodsley, in Custody of the Gentleman Usher of the Black Rod, for publishing a Pamphlet, intituled, "Manners, a Satire;" expressing his Sorrow for his said Offence; begging Pardon for the same, and assuring the House, "That he will never offend their Lordships again in the like Kind;" humbly representing, "That his Confinement from his Business will be a great Detriment, if not the total Ruin of himself, his Wife, and Family:"
Papers relating to the Convention with Spain delivered. The Duke of Newcastle (by His Majesty's Command) presented to the House several Papers, relating to Transactions between Great Britain and Spain; with a List thereof. "Extract of a Letter from Mr. Keene, to Mons. de la Quadra, Madrid, January 6th, 1739, N. S. and Translation." "Copy of a Letter from Mons. de la Quadra, to Mr. Keene, Pardo, January 10th, 1739, N. S. and Translation." "Copy of Mons. de la Quadra's Declaration, Pardo, January 10th, 1739, N. S. and Translation." "Copy of a Letter from Mr. Keene, to Mons. de la Quadra, Madrid, January 11th, 1739, N. S. and Translation." "Copy of a Paper signed by Mr. Stert, One of the Commissaries appointed in Pursuance of the Treaty of Seville, and laid before a Committee of Council, June 14th, 1738." Then the several Papers mentioned in the said List were likewise read. Motion for the Attendance of S. S. Directors refused. 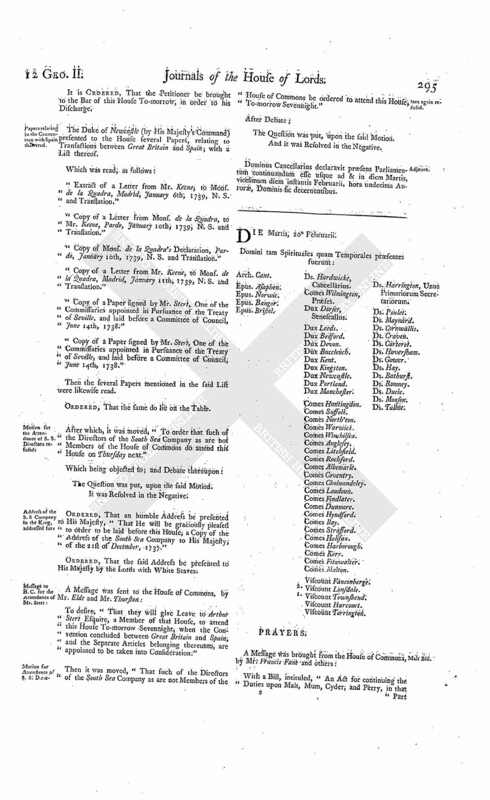 After which, it was moved, "To order that such of the Directors of the South Sea Company as are not Members of the House of Commons do attend this House on Thursday next." Ordered, That an humble Address be presented to His Majesty, "That He will be graciously pleased to order to be laid before this House, a Copy of the Address of the South Sea Company to His Majesty, of the 21st of December, 1737." 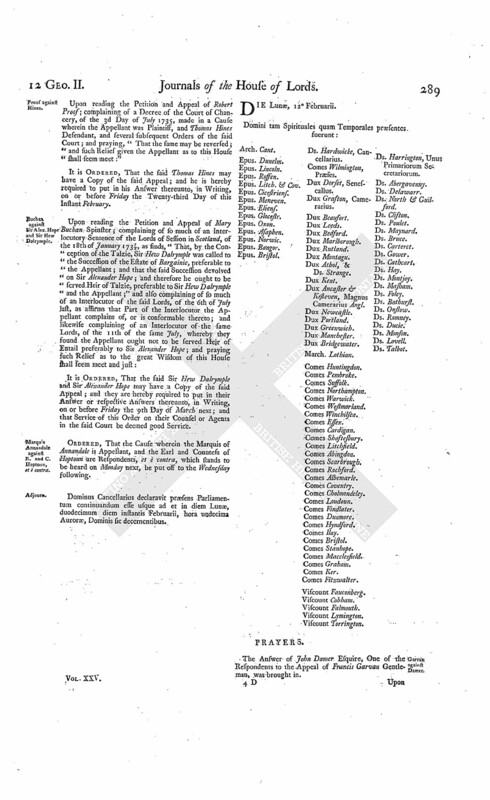 To desire, "That they will give Leave to Arthur Stert Esquire, a Member of that House, to attend this House To-morrow Sevennight, when the Convention concluded between Great Britain and Spain, and the Separate Articles belonging thereunto, are appointed to be taken into Consideration:"
Motion for Attendance of S. S. Directors again refused. Then it was moved, "That such of the Directors of the South Sea Company as are not Members of the House of Commons be ordered to attend this House, To-morrow Sevennight." Dominus Cancellarius declaravit præsens Parliamentum continuandum esse usque ad & in diem Martis, vicesimum diem instantis Februarii, hora undecima Auroræ, Dominis sic decernentibus. With a Bill, intituled, "An Act for continuing the Duties upon Malt, Mum, Cyder, and Perry, in that Part of Great Britain called England; and for granting to His Majesty certain Duties upon Malt, Mum, Cyder, and Perry, in that Part of Great Britain called Scotland, for the Service of the Year One Thousand Seven Hundred and Thirty-nine;" to which they desire the Concurrence of this House. Sherwin's Petition referred to Judges. 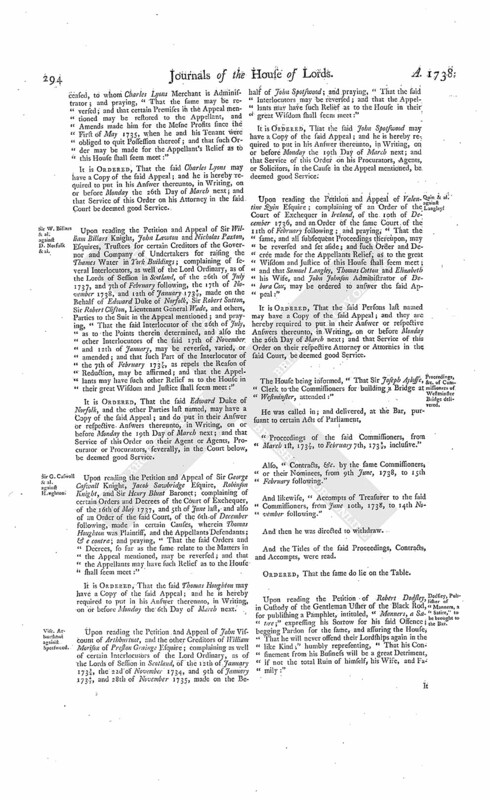 Upon reading the Petition of John Sherwin Esquire; praying Leave to bring in a Bill, for Sale of certain Freehold and Copyhold Estates, lying in the County of Hertford; and for settling other Estates, in the County and Town of Nottingham, in Lieu thereof:"
It is Ordered, That the Consideration of the said Petition be, and is hereby, referred to Mr. Justice Chaple and Mr. Baron Parker; with the usual Directions, according to the Standing Order. Worth's Petition referred to Judges. It is Ordered, That the Consideration of the said Petition be, and is hereby, referred to the Lord Chief Justice of the Court of Common Pleas and Mr. Justice Fortescue; with the usual Directions, according to the Standing Order. Downe's Petition referred to Judges. It is Ordered, That the Consideration of the said Petition be, and is hereby, referred to the Lord Chief Justice of the Court of King's Bench and the Lord Chief Justice of the Court of Common Pleas; with the usual Directions, according to the Standing Order. Townshend and Sayer's Petition referred to Judges. 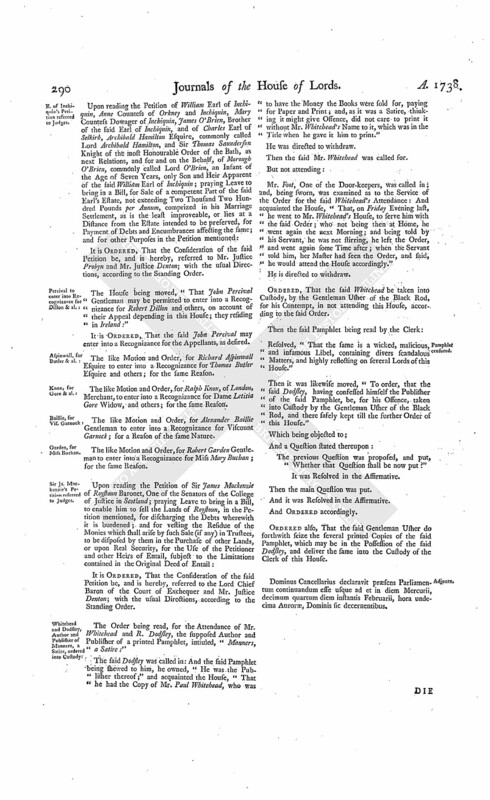 Hodie 1a vice lecta est Billa, intituled, "An Act for naturalizing John Hoffham Murison and Nathaniel Voogd." Grote & al. Petition to be added to it. Upon reading the Petition of Andrew Grote, Jacob Hackman, Cornelius Vand Waal, and Samuel Cley; praying, "That they may be added to the said Bill:"
It is Ordered, That the said Petition do lie on the Table, till the Bill be read a Second Time. Nadal & al. Nat. Bill. Hodie 1a vice lecta est Billa, intituled, "An Act for naturalizing James Nadal and William Rene Morin." Address for Copy of Address of the Directors of S. S. Company. Ordered, That an humble Address be presented to His Majesty, "That He will be graciously pleased to order a Copy of the Address of the Directors of the South Sea Company to His Majesty, of the 30th of June 1737, and His Majesty's Answer thereunto, to be laid before this House." The King's Answer to the Address of Yesterday. The Lord Steward reported, "That the Lords with White Staves had (according to Order) presented to His Majesty the Address of this House Yesterday; and that He was pleased to say, He would order the Copy therein desired to be laid before their Lordships forthwith." Robert Dodsley, in Custody of the Gentleman Usher of the Black Rod, for publishing a Pamphlet, intituled, "Manners, a Satire," was (according to Order) brought to the Bar; where he, upon his Knees, receiving a Reprimand from the Lord Chancellor for his Offence, was ordered to be discharged out of Custody, paying his Fees. The House being informed, "That Patrick Keaghran attended, in order to deliver in several Papers and Proceedings, in certain Causes, wherein James Lavallin and others are Appellants, and Christian Gould is Respondent, and John Roche and William Mahony are Appellants, and Robert Warren is Respondent:"
He was called in; and delivered the same at the Bar; and attested upon Oath, "They were true Copies, he having examined them with the Originals in the proper Offices in Ireland." Baillie to enter into Recognizance for Visc. Arburthnot. The House being moved, "That Alexander Baillie Gentleman may be permitted to enter into a Recognizance for Viscount Arthburtnot, on account of his Appeal depending in this House; he being in Scotland:"
Dominus Cancellarius declaravit præsens Parliamentum continuandum esse usque ad & in diem Jovis, vicesimum secundum diem instantis Februarii, hora undecima Auroræ, Dominis sic decernentibus.